The T-28E is a Rank II Soviet medium tank with a battle rating of 2.7 (AB/RB/SB). It was introduced with Update 1.47 "Big Guns". It is similar to the original T-28 in all respect except the additional armour welded onto the front, side, and rear of the tank. The additional armour improve protection against enemy fire, but slows down the vehicle due to increased weight. As with all other Soviet vehicles, the letter "E" behind the tank name means "ekranami" (which means "with screens" or "applique armour" in English). In this case, the T-28 received several 30 mm and 20 mm armour plates to enhance its protection. Whole main turret and machine gun turrets are reinforced by 30 mm plates, and Driver's viewport (a big weak spot) by 20 mm and 30 mm plates. Then there are several 20 mm and 30 mm armour plates installed on the sides and rear of the vehicle. All this armour adds about 4 tons to the weight, making it slightly slower than the original T-28. However, it is still very fast and mobile. The powerful, yet accurate gun, paired with large profile make the T-28 look ideal for long range encounters, yet its low penetration, slow shell travel speed and no real gun depression to cover yourself behind terrain quite discourages this kind of gameplay style. But the crew/equipment spacing, its high versatility and powerful main gun make this tank quite capable in a close range encounters. Hit and run tactics work pretty well (if the "run" aspect of it is ever needed). If you ever find yourself against too well armoured Medium or Heavy tank, it is often better to stay and try to fight, as the large profile of your tank makes you easy to be hit while retreating. Always aim for weak points like the driver's hatch or gunner's port. If you find yourself unable to ensure an accurate shot against such a small target, attempt to cripple the tank's offensive armament first to take some pressure off. The extra armour on this tank is noticable, especially when you angle your tank a bit, random poorly aimed shots will often be "consumed" by extra layers of armour, or machinegun turrets, or will simply ricochet off. However, this is only truth when you are playing as a "top vehicle" against weaker opponents. This tank has a slightly higher BR, and when MM puts you "on the bottom", your armour will unfortunately again protect you like a paper against bullet does. Heavy tank like KV-1 (L-11) is completely immune to all types of your ammo, even from the rear. Avoid it. Suspension wheels are 10 mm thick while tracks are 20 mm thick. Applique armour ranging from 20 to 30 mm in thickness cover the tank, but do not cover the entire surface area. Ammo racks of the T-28 (identical to T-28E). Armour is good when playing as a "top tank"
Total of 3! machine guns can make short work of any unarmoured AA vehicles. Prerequisites set up in 1929 called for an infantry support and breakthrough tank that are able to exploit breakthroughs and handle infantry fortifications. The development of this tank under Chief engineer S.Ginsburg may have been inspired by the British Vickers A1E1 Independent tank as the final design took some elements of it. The end result was a multi-turreted medium tank with a 76.2 mm L-10 main gun and two 7.62 mm machine gun turrets in front. The design was satisfactory that Stalin himself ordered a heavier variant of the tank that can suit the breakthrough role, which would be the T-35. The first multi-turreted was designated the T-28 and was considered revolutionary for the time as it was the first medium tank of its kind and would establish the concept of such tanks. 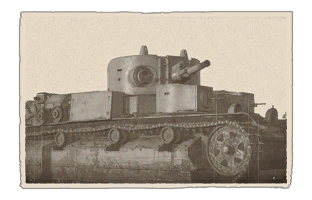 The first prototype of the T-28 was created sometime in 1931, its design was considered revolutionary for the time as it was one of first medium tanks in the world. Production of this tank began in the Kirov Factory in Leningrad sometime in 1932, and it was accepted into service in August 11, 1933. Though in service for eight years from 1933 to 1941, only 503 units were produced. The T-28 was relatively slow for its weight, but as an infantry tank, this disadvantage was mitigated by its role and its heavier armour. The front two turrets with machine guns are installed in front of the main turret, which was considerably higher. The main turret was a shared feature from the T-35 in order to standardize parts in production. The tank was initially to be armed with a 45 mm gun like the BT and T-26 light tanks, but the larger 76.2 mm howitzer was chosen instead for added explosive power. The turret had a turret basket and a rear-facing machine gun. A later upgrade had a commander's cupola added onto the turret plus the capability to mount another machine gun on top for anti-aircraft purposes. The tank had a crew of six (driver, two machine gunners, loader, gunner, commander) and ran on a V12 M17 air-cooled engine that can deliver 500 horsepower. Though providing enough power to propel the T-28 at a speed of about 37 km/h (22 mph), the gasoline fuel it used was flammable and rare in Soviet usage. The armour on the tank was 30 mm maximum on the front and side glacis, which was sufficient enough to stop most anti-tank armament at the time. The suspension on the tank was a bogie system with plunger springs and usually has a 20 mm thick side skirt protecting the sides. Transmission and engine compartment is at the very rear under a canopy for easy access. At its introduction in 1933, the T-28 was one of the most effective tanks in the world, and had a few innovations. Other countries only had WWI-era Renaults and the Germans had no tanks of their own at its development. The T-28 was also the first to have radios and anti-aircraft gun mounts. The standard organization of the T-28 tanks in 1939 was 136 T-28s and 47 BT-7 in one heavy armoured brigade. The T-28s were first deployed on the eastern borders during the border clashes with Japan in 1939. The first large scale action was in September 1939 when the Soviet Union invades Poland with its front line fleet of T-28s. Though the Polish tanks and anti-tank guns were able to take out a few T-28s, it is not known how many were lost. The next conflict the T-28 served in was the Winter War against Finland. These tanks were used against Finnish fortifications, but the conflict also showed the inadequate armour on the T-28, where Finnish anti-tank guns were able to reliably penetrate the tanks. Though over 200 T-28s were knocked out in the conflict, only 20 were totally lost due to system of armour recovery and repairs the Soviet had and the conflict's close proximity to the Kirov Factory, some tanks were repaired more than five times and sent back to the front. The Finnish were able to capture seven of these (2 in Winter War, 5 in Continuation War)and used them against their users. The Finnish came about to nicknaming them Postivaunu ("mail coach") after an incident where a T-28 commander was captured carrying the salary and mail for the 91st Tank Battalion, and Kivitalo ("stone building") for its large size. The heavy weight of the tank caused the Finnish to be unable to tow some of the knocked out T-28s for capture, so those unable to be recovered were stripped of their equipments. 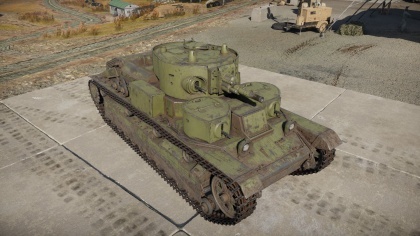 After Finland, the T-28's inadequate armour was showcased to the Soviets and an attempt at uparmouring the design was made in 1940 with the welding of additional armour plating to increase the 30 mm armour to 80 mm of armour in thickness. This increase in armour made the tank now weigh 32 tons. This up armouring of the tank was designated the T-28E. During the German invasion in Operation Barbarossa in mid-1941, the Soviets had about 411 T-28s in their inventory. Many were lost not due to battle, but actually from mechanical breakdowns due to lack of spare parts and low maintenance, causing them to be abandoned by the crew. The Germans were able to capture at least two of these tanks and may have used these against the Soviets as the T-28 746(r). The T-28s that were not lost during the first few months of Operation Barbarossa took part in winter defense of Leningrad and Moscow. Though still in inventory, by 1942 they were rare in Soviet service and declared obsolete as better tanks like the T-34 was taking over its role and is more heavily gunned, more armoured, and faster. The tanks still in one piece were dismantled for spare parts or sent to training facilities.